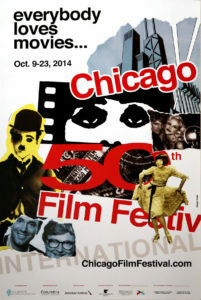 From opening night, October 9, 2014, until the last film on October 22, the special anniversary of the 50th Chicago International Film Festival was “film-tastic” as always! The “24” films that I viewed at the festival, with the exception of Miss Julie, were all shown at the AMC River East Theaters. In summing up the festival, I find that it is reminiscent of being on a world cruise. Every stop (film) is a new experience to embark upon a country’s culture. The cinematography leaves lasting snapshots in your memory, evoking different senses in each frame. First, it is a lush, tropical landscape; the next, a snow-covered ski village, then to a hidden beach beckoning romance with its shimmering waves. The varied plot lines take you to a family celebration with ethnic foods along with music that is enhanced with a draping of dramatic overtones to a silly song inducing an outburst of laughter. Will you prefer elegant candlelight dining to a homemade sandwich in a sunny park? Will it be a spirit-filled evening in a church or late night clubbing into the wee hours? Before you sail on, you’ll have just one more stop: Q&A’s with the directors, to ask questions that you simply must know the answers to, or just to commend their talent and labor on their recent creations. Again, this year’s 50th CIFF offered a five-star “port of call” for everyone’s film itinerary from features to shorts. And I can’t wait to book a passage on the 51st CIFF. If only they’d sell chocolate gelato in the theater next year. This classic has special meaning to the 50th CIFF, as its star, Colleen Moore, was the co-founder of the Chicago International Film Festival. Before the screening, Michael Kutza and film historian David Robinson shared entertaining memories and history of Ms. Moore’s life. She was the first “flapper” girl and started the “bob” haircut trend. Originally released, it was a top box office draw in 1927. This film was recently found in Italy and restored. Unfortunately, her other films, which she donated to the NYC Museum of Art, were lost years later. She’s really a good girl at heart, from a loving but poor family, but wants the boys to think she’s a high-stepping flapper with questionable virtues. But when she falls unknowingly for her wealthy employer’s son, she has to prove it’s really all an act. Even more rare, the movie is accompanied by its original music score. You’ll see why this former Chicago Star shined brightly with many films to her credit and went on to become a successful business woman after retiring from acting. Her encouragement and assistance made it possible for the start of CIFF with Kutza, and now we’ve had years of enjoyment from their efforts. Nilly, a new kid in town, befriends his neighbor Lisa. They check out the reclusive inventor Dr. Proctor after Nilly hears an explosion with smoke coming from the doctor’s backyard. These three strike a friendship that will have adults and kids laughing as the farts fly to crazy heights and adventures with the doctor’s latest invention. It’s a heartwarming story with teamwork, evil villains, bullies, and a lost love. These unlikely characters friendship prove it’s never too late for justice to prevail! Based on the children’s books by Jo Nesbo, let’s hope the DVD will release in the US, as it is a family film to be enjoyed by all ages. Two best friends, clueless in life experience and skills in the real world, start out on a bike trip from Williamsburg, Brooklyn to a popular but remote beach. It’s like a Dumb and Dumber cupcake with Clueless sprinkles! However, it involves a blonde and a brunette and they both seem to take turns on the “best idea wheel” while spinning out of control. You can’t help but continue laughing and start to feel a trifle of compassion for these sheltered girls, who realize at twenty-five that they need more of a plan than surviving on Daddy’s money, or running off to the Peace Corps to escape reality. Who knew a simple bike ride could be filled with so much chaos, or is it dumb luck? Elena and Antonio prove that opposites definitely attract! But as time evolves, is passion all you need when you’re such polar opposites in everything? Add two children and only one with a successful career! Filmed in the coastal towns of Southern Italy, the beach shots help capture nature’s essence of what evolves between two people destined to be together through sickness and health, youth and maturity. This is another film festival of mine, as was Ozpetek’s Loose Cannons. His films draw you into different scenes, like you’re the relative celebrating, crying, and dancing right along with the characters. Mr. Ozpetek and his multiple films are no strangers to the CIFF, besides being on the 2014 Jury of the International Feature Competition. He also attended the Q & A after his film. He said he wanted us to draw our own conclusion on the ending, but gave us a hint! Ozpetek even took time outside of the theater for more questions. This film revolves around the returning guests over the years who stay in the only still presentable, functioning room in an old, rundown hotel that is for sale. The piano in the room sometimes lends meaning to the stories: from young couples to an aging pianist, laughter to sobbing, and even murder. The hotel maid’s entwinement with the manager adds another raveling thread to her future and keeps you connected to the darker and lighter sides of human nature, wondering what the next visit will hold! This was in the Local Shorts 1 Category at the CIFF. It is an animated short about a single girl named Ava looking for her dream man and Speed Dating is her last-ditch attempt at finding him! But after entering, she wonders if she should bolt for the door – maybe being single isn’t so bad! Another fest favorite of mine, because, trust me, it really painted a realistic and humorous picture of today’s dating world! It should be a dating site film advertisement that promises, “This won’t happen here.” HA HA! Yeah, right! This is a rather comedic fresh take on a coming of “college” age film with Brian and Leslie struggling to find their way. They are both a bit geeky and find out that alcohol is not their friend for the future. Brian and Leslie are definitely not lucky, as their one night together turns into twins! The difference in their families’ dynamics brings insight and warmth to their situation and molds the life-changing decisions they’ll need to make. This is a realistic film for young adults to watch how their lives can change overnight! A marriage, two small kids, and career stress are difficult enough, so thinking a family ski holiday will energize and bring a Swedish family closer does not go as expected. When this family is faced with an avalanche, this unexpected snow evokes buried insecurities and bad manners with intermittent powdering of cutting dark humor. Their friends’ opinions also thwart needed forgiveness between them. The beautifully shot landscape scenes will beg of you to ask what would you do in that instant?